The Worldmap view enables you to easily toggle between these monitoring dimensions by selecting tabs along the top of the view. To access the Worldmap, click the User experience index tile on your home dashboard. 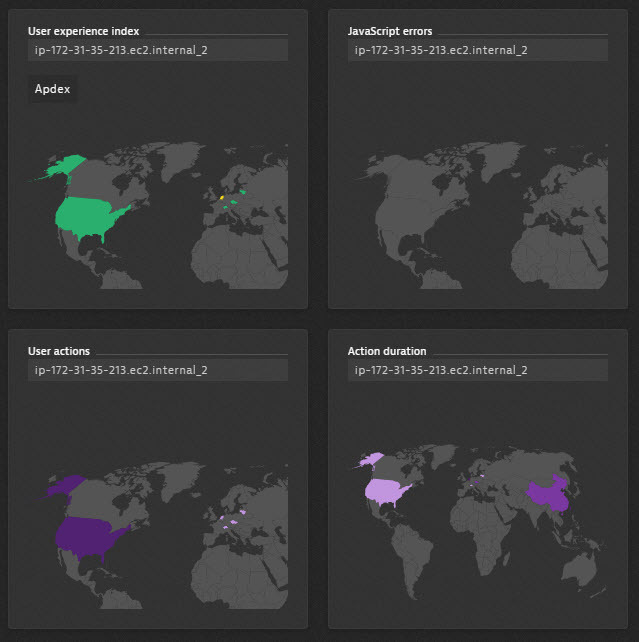 The User experience index tile on your home dashboard details your most active application&apos;s Apdex ratings for geographic regions around the world for which statistically meaningful monitoring data is available (see top-left tile in image below). User experience measurements displayed on world map. Apdex view (above) and User actions view (below). Click Add tile + on your homepage to access the tile catalog. Select the User experience index tile. Select an application to be analyzed from the drop list.